This video shows the performance of Akita Kantou, one of the most exciting features of the Honolulu Festival. 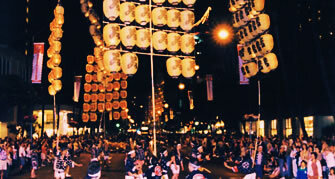 Each of the bamboo poles is 15 meters long, bearing 46 lanterns and weighing up to 50 kg will be carried using the palms, foreheads, shoulders or lower backs of the performers. This balancing technique is a must-see.